This is a 8" x 10" photograph hand signed by NFL Baltimore Colts' Gino Marchetti. This item is authenticated by All About Autographs. All About Autographs is a leading source for authentic sports and celebrity memorabilia. A Certificate of Authenticity accompanies the item and a tamper resistant holofoil is placed on both the item and the COA. The unique serial number on the holofoil is then registered in the All About Autographs Online Database which will list a detailed history for the item signed. All items will come with a photo from the signing when available. 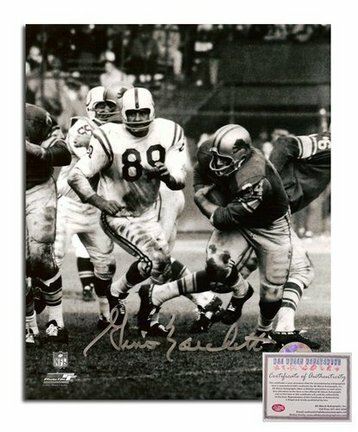 You found Gino Marchetti Baltimore Colts Autographed 8" x 10" White Jersey Photograph (Unframed) in category Football and subcategory FanShop. If you need to buy more FanShop than you are on the righ place. Enjoy this photograph featuring NFL player Mark Sanchez of the New York Jets. A great collector’s piece for any New York Jets fan!About this photo: OFFICIALLY LICENSED Photo Custom printed and cropped on high-gloss photographic paper Mounted in an acid-free mat with precision cut beveled edges Made in a custom photographic lab, not on a printing press Each game-action or portrait photograph was taken by a professional photographer Photo File is an authorized licensee for this photo Outside matte is eggshell white with a black interior matte. Note: This is an unautographed photograph. 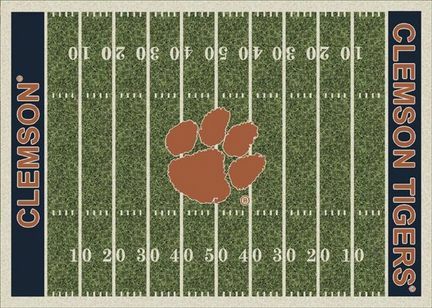 Black anodized aluminum frame Size with frame is 11"x14"
Get in the Game with this NCAA Clemson Tigers Home Field area rug from Milliken and Company - the leader in textile research and design. Made of 100% nylon pile fiber. Made in the U.S.A.Rug Dimensions: 3' 10" x 5' 4"To view all the Milliken Area Rugs available for this team please click here. 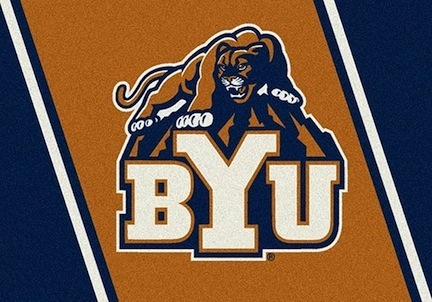 Get in the Game with this NCAA Brigham Young (BYU) Cougars Team Spirit area rug from Milliken and Company - the leader in textile research and design. Made of 100% nylon pile fiber. Made in the U.S.A.To view all the Milliken Area Rugs available for this team please click here. Durable and attractive, this tufted acrylic rug is made of tough material with non-slip foam rubber backing. 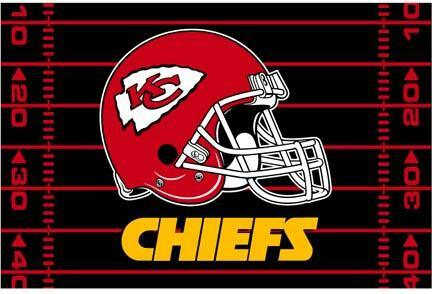 It features the Kansas City Chiefs logo printed in vivid color. Perfect as an accent rug, utility mat or even a wall hanging. No true fan should be without one.